Or, at least, a year ago. Time is noticeably flying by faster as I get older and older. 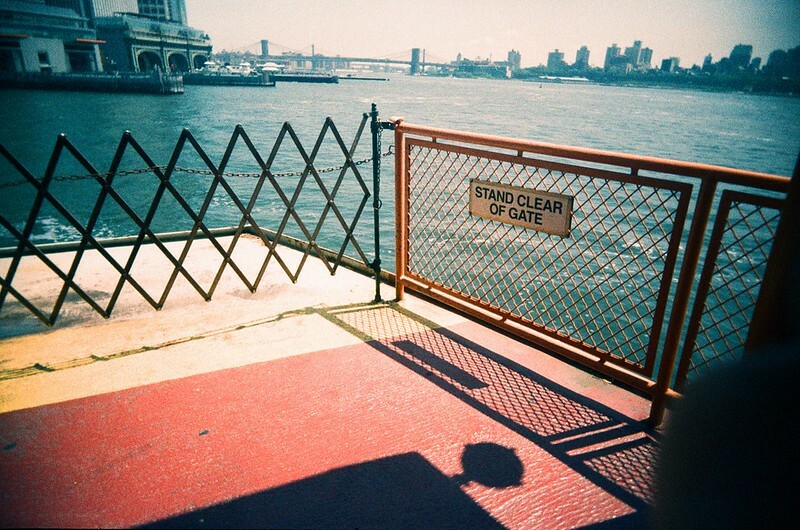 I took this photo in New York a year ago today on the Staten Island Ferry. It’s a good way to see the Statue of Liberty and the Manhattan Skyline, and it’s free. This was taken with a Vivitar Ultra Wide and Slim on expired Kodak Ekachrome 160T film, which I then had cross processed. I had a stash of this which I obtained a few years back from World of Photography in Columbus, Ohio, and I love the creamy, pinky tones that it gets. Nothing like the crazy greens and blues you often get with cross-processing slide films. The T means it was originally balanced for tungsten light which has a yellow cast. I shot my last roll of this in Rome a few weeks later. I could go hunting on eBay for more, and maybe I will some day. But right now I feel like I need to buy some more fresh film to remind the shops and the distributors and eventually the film companies themselves that there’s still a market for it. Over on Flickr right now I am uploading a batch of pics I took in summer and autumn last year. I spent Christmas in the States and shot about 6 rolls of various films, but commitments at home have prevented me from getting them developed. Apart from a trip to Iceland in February I’ve not been actively shooting film much this year so far due to a run of bad luck with multiple illnesses and a lot of demands from my life. My output is always going to be behind the times. I think about the future all the time and try to live right now in the present, but I reflect on the past a great deal too. The built-in waiting time of film is a lovely way to do this. This entry was posted in Art, Memories, Photography, Travel, Writing. Bookmark the permalink. Expired film and the VUWS seem to go together like peas and carrots.